TwinSpires Blog: Thy ‘Kingdom’ Come... Will He Conquer? Thy ‘Kingdom’ Come... Will He Conquer? 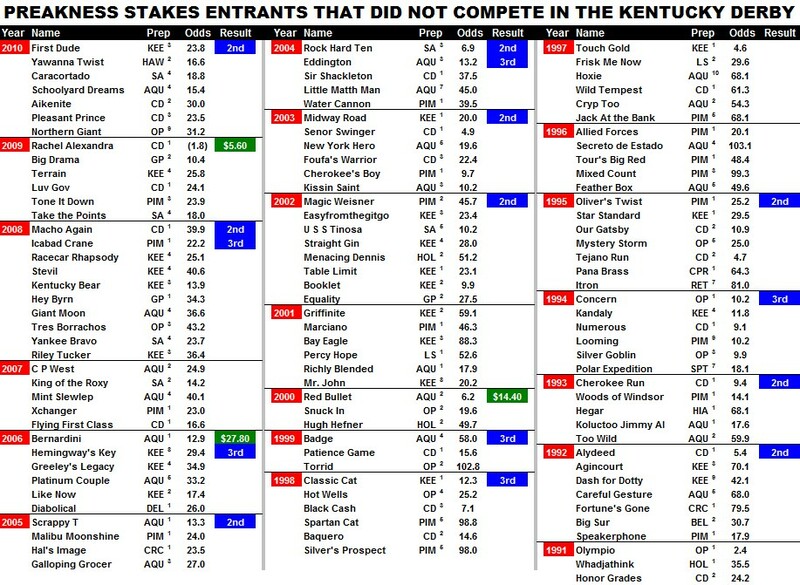 In the past six years, only one Kentucky Derby winner (Big Brown) has managed to duplicate that success in the Preakness Stakes. And it’s been 33 years — basically, the life span of two Justin Biebers — since Affirmed outdueled Alydar to sweep the Triple Crown. Given those sad statistics, Animal Kingdom’s hopes of adding to his Louisville legend would appear to be deader than the nerves in Kenny Rogers’ face, right? Not so fast, my cynical friends. To begin with, the Team Valor colt rallied off of an extremely slow pace in Louisville on May 7, which bodes well for his chances this weekend in Baltimore. Since 1932, when the order of the Triple Crown races was finally set, seven (of nine) Kentucky Derby winners that trailed by two lengths or more at the first call of a moderately-paced Run for the Roses (-7 Early Speed Ration or greater) triumphed in the Preakness as well. In this year’s Most Exciting Two Minutes in Sports, pacesetter Shackleford recorded a -1 ESR and Animal Kingdom was 6 ¼ lengths behind that foe at the first call. Lastly, even a nursing home full of cantankerous ex-defense lawyers would find it hard to argue that the son of Leroidesanimaux won the Derby in anything less than scintillating fashion. 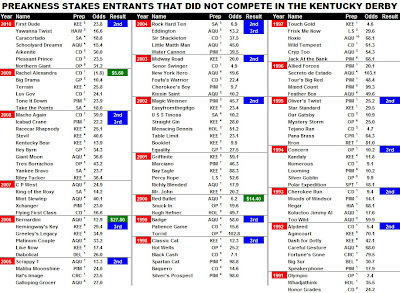 1) Since 1990, seven horses improved their latest Brisnet speed figure by six points or more while winning the roses; none of the half-dozen that subsequently competed in the Preakness (Grindstone was retired) managed to win. Animal Kingdom recorded a 105 Brisnet speed figure at Churchill Downs — eight points higher than the 97 he earned while annexing the Spiral Stakes at Turfway Park on March 26. 2) It is little secret that leading at the stretch call of the Kentucky Derby often leads to a wreath of roses, but it’s not a bad way to get a bouquet of Black-eyed Susans either. 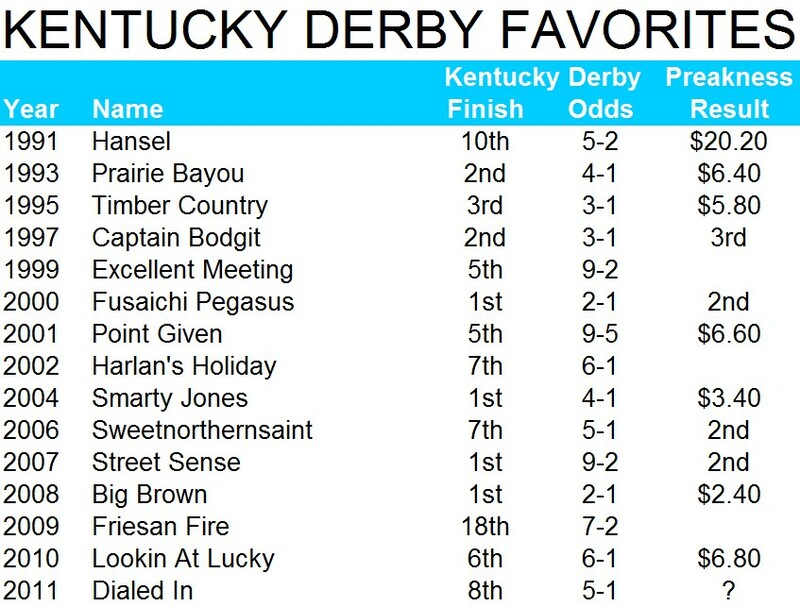 Of the 29 Derby winners that also captured the Preakness since 1932, just five (of 17) were not in front at the 1/8-pole in Louisville. 3) In the past 66 years, Big Brown stands as the only Derby winner to capture the Preakness with fewer than four previous sophomore starts. “Brown” paid the princely sum of $2.40 to win. 4) And speaking of mutuel prices, only four of 20 Derby winners that returned $20+ in Louisville were able to triumph — at any price — in Baltimore. OK, now that I’ve explained why I won’t be betting on Animal Kingdom in the middle jewel of the Triple Crown (at least to win), I suppose it’s only fair to reveal which steed will be receiving the bulk of my wagering attention on Saturday. The answer is… drum roll, please… Dialed In. Frankly, I didn’t think Nick Zito’s charge stood a snowball’s chance in a Pauly Shore movie marathon in the Derby — largely because I felt his lack of experience and one-dimensional running style would surely get him into trouble. But unlike the Run for the Roses and the Belmont Stakes, the Preakness tends to highlight the best three-year-old in training and, at least right now, I think that horse is Dialed In. His poor showing in the Derby can be excused. The son of Mineshaft stood virtually no chance after such a sluggish opening half-mile, especially since he trailed by nearly 20 lengths at that juncture. Look, I like Leparoux, I think he’s a fine young rider, but clearly the clock in his head was on the fritz on the first Saturday in May. Either that or Leparoux was simply following instructions from Zito and company, who, like so many others, were duped into believing that this year’s Derby splits were going to be sizzling. In fact, the :48.63 opening half-mile at Churchill was the slowest since 1947, when Jet Pilot needed 49 seconds to traverse the first four furlongs over a track appropriately labeled “slow.” The only thing coming back after fractions like that were the lunches of those that made Dialed In the 5-1 Derby favorite. 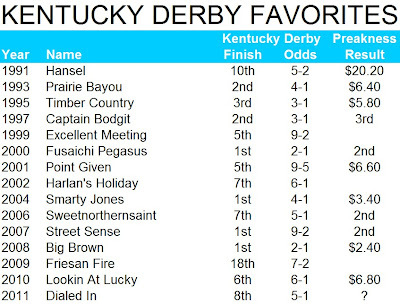 The Preakness pace figures to be much swifter. In addition to the aforementioned Shackleford, the quick Dance City along with Flashpoint and Astrology are all scheduled to compete this weekend. That, coupled with the knocks against Animal Kingdom and the probable odds, make this year’s Preakness an easy call for me: Dialed In is the logical play… we’ll just have to wait another Justin Bieber or two for the next Triple Crown winner.